East Lansing is a city in the U.S. state of Michigan directly east of Lansing, the state capital. It is best known as the home of Michigan State University. The city's downtown area is centered around Grand River Avenue, a wide, tree-lined boulevard that evolved out of the 19th-century plank road that connected Lansing to Detroit. Grand River Avenue and Michigan Avenue serves as a dividing line between the Michigan State University campus and the rest of the city. The street is lined with many college-oriented businesses, such as bars, tanning salons, coffee shops, head shops, restaurants (many dine al fresco) and bookstores. Immediately north of downtown are predominantly student neighborhoods. Further north is the residential part of the city. In the northernmost tier of the city are several new housing subdivisions and student-oriented apartment complexes. East Lansing has more than 25 neighborhoods, many of which have neighborhood associations that sponsor social events, attend to neighborhood issues, and often advocate for neighborhood interests in meetings of the City Council and city commissions. A section of the city has been designated a Historic District, and a Historic District Commission has been established by the City Council. In addition, many landmark structures in the older neighborhoods have been identified within a Landmark Structures Historic District of the Historic Preservation Code. 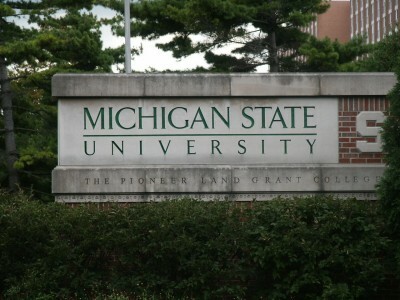 Michigan State University, a member of the Big Ten Conference, is the largest education institution in the State of Michigan (7th largest in the United States), reflecting East Lansing's history as a college town. Nearby Lansing is home to several other colleges, including Thomas M. Cooley Law School, which is the largest law school in the United States (by attendees), Davenport University, and Lansing Community College. Michigan State University has the reputation of having a very passionate fan base. Spartans followers have attracted notoriety with public celebrations that periodically erupt throughout the year.